Romain Grosjean says Fernando Alonso's testing crash raises questions about the safety of the AstroTurf used on the outside of some corners in Formula One. Alonso spent three nights in hospital after hitting a wall side-on on the final day of the first Barcelona test, a crash which briefly left him unconscious. The Spaniard has now left hospital but the team confirmed he is perfectly healthy, though he is sitting out the final test this week as he continues to recuperate. McLaren said unpredictable wind pitched Alonso's car off the circuit and onto the AstroTurf which lines the outside of Turn 3, leading to a loss of traction which spat the car back across the track. AstroTurf is used at many circuits and is designed to punish drivers for exceeding track limits by reducing grip. Grosjean is uneasy about the use of the material and says there are several examples on the F1 calendar which cause drivers concern from a safety standpoint. 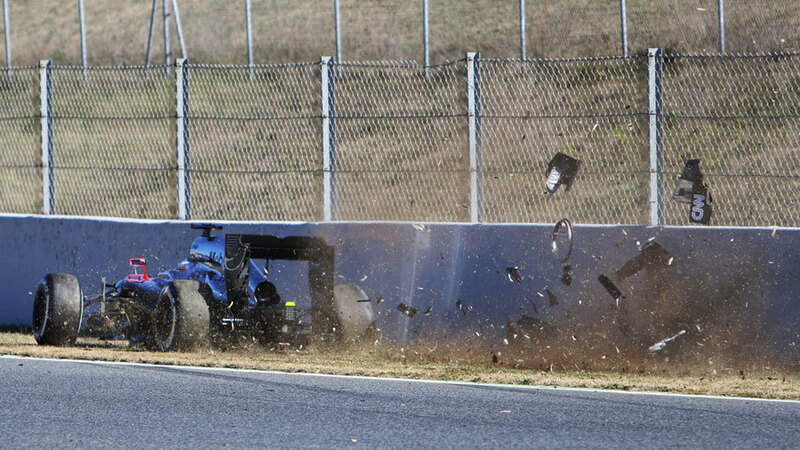 "I don't know what happened," Grosjean said when asked about Alonso's crash. "I know that day was very windy and gusty which makes Turn 3 a bit tricky. I don't know if he went on the AstroTurf on the exit [but] I hate that surface because when you get on it … you lose the car or it stays straight. I don't know if he hit that and then went into the barrier. "There a few places where you really don't want to go on the AstroTurf. 130R in Suzuka, the long Turn 8 in Austin where they added AstroTurf and it wasn't there the year before. It's a trade-off in-between stopping the car from leaving the track and of course safety. At the moment it's the best material we have so it's fine. Sometimes you can cross it more than others, like India, you can play quite a lot with them, and there is other places where you just don't want to use it." Grosjean says the fact Alonso was knocked unconscious after the crash highlights one problem with how modern F1 cars are designed. "But that's the problem. If you hit sideways, the wishbones and so on are not done to be breaking that way. They won't bend … its carbon so either they break or they stay in one piece. If it stays in one piece then the energy has to go somewhere and that's in the driver. "I think first we can be happy he's OK and left the hospital. Second thing we can learn is to get the drivers safety a bit higher up when it's lateral impact."